A guide to Amish furniture in Montana Most people don’t realize that Amish have lived in Montana for over three decades. Five Amish communities–and a number of Amish furniture makers–are found in the Treasure State. Amish furniture dealers can also be found in Bozeman, Missoula, and within driving range of Billings, Great Falls, and other towns and cities across Big Sky Country. The range of Amish furniture products is extensive, including tables, chairs, kitchen cabinets, outdoor furniture, bedroom sets, office furniture, and much more, in styles such as Mission, Shaker, Colonial, Craftsman, Queen Anne, and Contemporary. In addition to traditional styles, log furniture is a popular variety among Montana Amish. This Montana Amish furniture guide lists businesses where Amish woodworking can be found in-state. Wide variety of log furniture handcrafted by Amish in northwestern Montana. Tables, chairs, gun cabinets, curios, bookcases, log beds, nightstands, file cabinets, armoires, benches, pet furniture, and more. Outdoor Amish log furniture includes log rocking chairs, benches, swings; rustic deck gliders. Also Amish pine furniture including dressers, entertainment centers, desks. Amish-owned company founded 1991; billed as “largest…manufacturer of rustic furniture in the nation”. Montana Amish made log furniture; 650+ products available. Tables, dressers, nightstands, benches, bookcases, sofas, children’s furniture and more. Log furniture created from lodgepole pine; some items from hickory and cedar. Logs harvested from Kootenai National Forest using environmentally-friendly methods. Custom Amish furniture also available, as well as custom Amish cabinets. Custom location of Montana Woodworks Amish furniture (see above). Variety of furniture producers including Amish-made. Bar stools, coffee tables, swivel stools, Amish hickory furniture including hickory gliders, beds; hickory-and-oak chests and nightstands. Retailer of Montana Woodworks Log Furniture (see above). Want to search Amish furniture beyond Montana? Try the Amish Furniture main listings, with a directory of Amish furniture retailers in the US and Canada. Note to Montana residents: Please be sure to check opening hours of any Amish furniture businesses listed in this guide before traveling long distances. While we strive to keep this directory up-to-date, business locations and schedules can change. Not responsible for changes to information. The trailblazers of today’s Montana Amish population arrived at Rexford in Lincoln County in Montana’s extreme northwest in the mid-1970s. The landscape they arrived at was quite different than that found in heavily-populated dairy farming-oriented eastern Amish settlements. While Amish have long thrived in the fertile farming regions of Pennsylvania and the Midwest, Western settlers (including Amish migrants to states like Montana and Colorado) have found growing conditions less favorable to small-scale farming. Small business such as woodworking shops have helped Amish thrive outside of the traditional agricultural sphere. For Amish in Montana and elsewhere, furniture making allows one to make a living with a relatively small initial investment. Furniture-making skills are learned in an apprentice-style system, with Amish youth learning the ins and outs of woodcraft from a young age. Amish counterparts in more agriculturally-oriented communities have also jumped into the furniture-making industry with both feet. With land prices in traditional communities sky-high, small enterprise run from an at-home shop has proven an appealing alternative to the traditional dairy farm. Amish-made furniture has gained strong appeal with the buying public. A number of factors give Amish furniture a valuable cachet, vaulting it beyond what is typically found in the standard big box furniture retailer. For one, Amish furniture is widely regarded to be high-quality. Amish value work well done. Producing quality goods come naturally to a people whose forefathers constructed sturdy farmhouses and barns that have stood the test of time for over 2 centuries. Amish furniture is typically constructed of solid hardwoods such as maple, oak, cherry, walnut, and more. Amish woodworkers devote a high level of craftsmanship to their furniture, resulting in pieces often referred to as “heirloom-quality”. Secondly, Amish furniture offers good value. Is Amish furniture the cheapest? Typically not. However, Amish furniture businesses in Montana and other states actively keep costs down by running no-frills operations. Since Amish furniture is built to last, buyers should expect to pass their furniture pieces on to the next generation. Amish furniture buyers get durability and quality for their money. Thirdly, to state the obvious, Amish furniture is (in nearly all cases) American-made. Nearly all of the 250,000+ Amish live in Montana and 27 other US states (a small population of Amish lives in Ontario). Amish craftsmen construct their furniture in America, in stark contrast to the foreign-made imports that have increasingly been seen on the furniture market in recent years. For buyers who value American-made products, Amish furniture fits the bill. Finally, Amish furniture comes with “Amish appeal“. Buying from an Amish furniture maker in Montana or other locations, you can take satisfaction from knowing that you are supporting a family-oriented way of living. Amish wish to preserve the community and Christian values that have undergirded their society for over 250 years in North America. Supporting a small Amish family furniture business, you are helping to assure the continuation of Amish culture. Not only that, but buying from a small family-run shop, filled with the smell of sawdust and the whirr of saws, offers an experience quite unlike a visit to the local shopping center. If you’re looking to purchase Amish-crafted furniture in Montana, there are a number of options available. Firstly, you can buy direct from an Amish furniture craftsman. 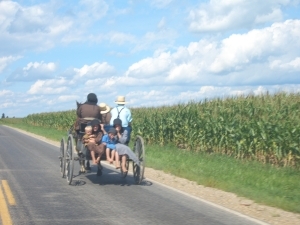 Amish live in 5 locations in Montana: Rexford (Lincoln County); St. Ignatius (Lake County); Whitehall (Jefferson County); Moore/Lewistown (Fergus County); and Ashland/Forsyth (Rosebud County). All are small settlements, not exceeding more than a few dozen families each, but at least some are home to Amish furniture craftsmen (ie Rexford). Montana’s Amish presence is not growing as rapidly as communities in the east, but it is established (read more on Montana Amish communities). Treasure State residents can also purchase furniture from Montana Amish furniture retailers. Non-Amish (aka “English”) partner with Amish furniture makers to sell Amish furniture in Montana and elsewhere (a common arrangement). Seekers of Montana Amish furniture have at least two routes they can take to find a diverse range of Amish-crafted woodwork in Big Sky Country. In reality, there is a third option: purchasing Amish furniture online. Benefits include the convenience of shopping from home, ability to view a wide range of products, and in some cases ability to custom-order furniture. The Montana Amish log furniture is second to none in quality and beauty. We are trying to find you. We want to be a customer of yours. We tried calling the number (406)283-1535. It’s not working. Please call my husband Albert Black at (406) 261-6398. Or me, Christy, at (406) 261-0519. Thank you. I’ve been a collector of Amish made furniture for many years now in Montana and the best way to get traditional Amish furniture with an Arts and Craft or Empire look that you will be satisfied with is to fly or drive to Welcome Amish Furniture in Albertville, Minnesota, and bring it back yourself. This is the closest trade route to Montana from the Ohio and Indiana Amish furniture makers and well worth the trip. They have a huge warehouse of the best, and I mean the best built Amish furniture for your home in Montana. Buying Amish furniture on web sites is risky,you need to see the finished product in person. Unfortunately,you have to get actively involved with buying this unique art form if you live in this state. I have physically been to other Amish shops in Indiana and Ohio that don’t advertise on the web that also make beautiful pieces. I have pictures and dimensions of a wood king size bed I would like to be made. Who do I contact?